S Kumars Nationwide (SKNL), the flagship company of the SKNL group, is a vertically integrated company from yarn to garments. 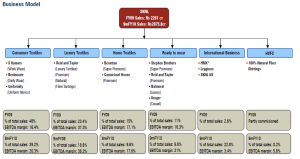 The company also operates in the home textile segment. SKNL is the market leader in uniforms with 30% market share. The company is in the business of selling branded products through its vast distribution network of 400 wholesale dealers, 30,000 retail points of sale and 726 exclusive brand outlets (EBOs). The company operates 47 well established textile brands including brands like Reid and Taylor, Belmonte, S Kumars, Carmichael House, Stephen Brothers, Hicky Freeman, Hart Schaffner Marx, Bobby Jones among others.. The company operates through six major strategic business units (SBUs), namely, consumer textiles, total home expressions, total wardrobe solutions, luxury textiles, high value fine cotton (HVFC) and international businesses. Total wardrobe solutions and total home expressions have been increasingly gaining pace over the past four years. 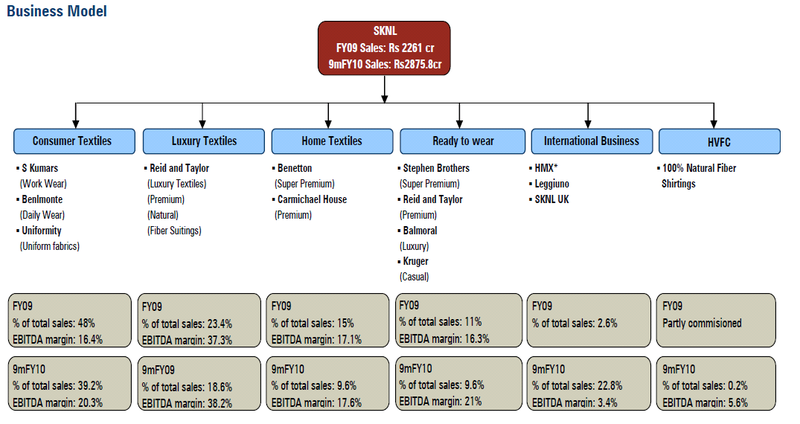 Luxury textiles enjoy the highest margin among all SBUs within the company. SKNL acquired Leggiuno in Q3FY09 and Hartmarx Corporation (now renamed as HMX) in Q2FY10. Leggiuno, an Italian company, is among the top three Italian high-end shirting fabric manufacturers. HMX, a US company, is the largest manufacturer and distributor of men’s suits and formal wear aimed at the mid and upper end of the US apparel market. HMX operates 34 brands (23 owned and 11 licensed) including brands such as Hicky Freeman and Hart Schaffner Marx.